Experience the true hospitality and rich culture of the Winelands, with our Cape to Grape Wine Tours. 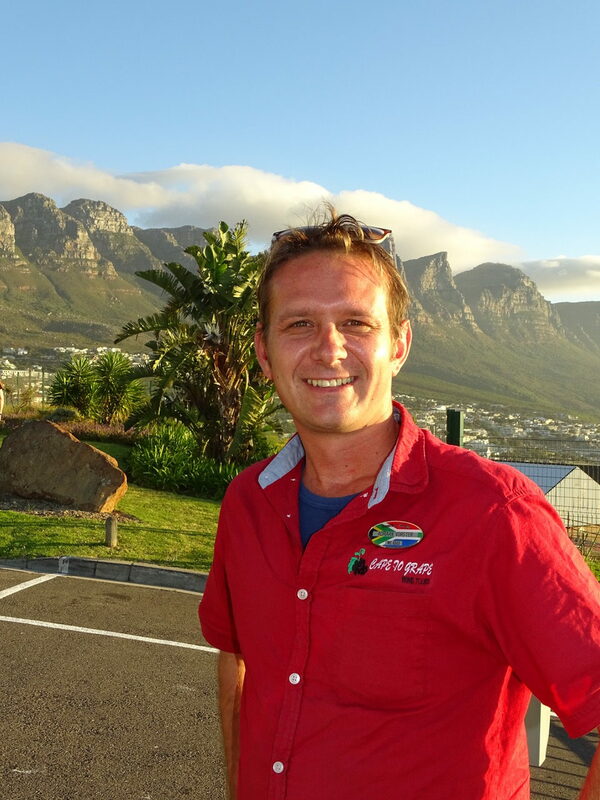 Cape to Grape Wine Tours was established in the beginning of 2011 by owner and guide Adriaan Vorster. As a native to the Breedekloof River Valley, Adriaan has had a passion for wine, vineyards and country living from an early age. Following his matriculation from Boland Agricultural School in 2003, he worked part-time in a wine cellar, gaining hands-on experience in winemaking. In 2006, he went abroad and taught English in Taiwan for 2 years after which he returned to South Africa and started working at Fairview Wine and Cheese Winery as a wine tasting host. Adriaan is very passionate about the wine industry and tourism, and expanded his knowledge by completing several wine and tourism courses, including All about South African Wines in 2010. Today, Cape to Grape Wine Tours offers intimate and affordable tours for everyone. Adriaan guarantees that your South African experience will be unforgettable with all the best that our beautiful Cape has to offer. We joined this tour end of September and had a very enjoyable day. You will visit a couple of wine estates and learn a lot about wine. The pairings are also very good. We have been lucky enough to end up in a private tour. We would always recommend it.